When I was first sent Brush baby bits to try, my girl had already graduated to a toothbrush and so my nephews did the test for me instead. So by the time Cub came along I knew exactly what to use when those pegs reared their sleep defying little stumps. He suffered with teething and like his sister, those pegs were raring to go and he had almost a full set by the age of one (there were a few you could see under the skin from birth). He loved nothing more than chewing on the toothbrush and it helped relieve the pain, so I would not hesitate to recommend the toothbrush to all little people. I recently got sent this set of goodies through a twitter competition and seeing as Bubba is a fully fledged toothbrush girl (we kept the toothpast to use), I thought I'd pass onto my nephew to test out for us as he is just under a year old. First we had to wait until he had some teeth to test on the soft chewable toothbrush and also the dental wipes. 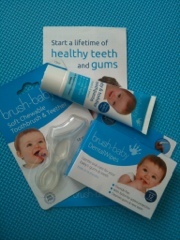 Little M has two teeth and more on the way and we started using this a week ago. I was sceptical at first and M didn't seem keen but a week in and he loves a good chew on it each evening. It's an odd shape but as its quite big it gives him plenty to chew on and I think the silicon makes it really squashy so no chance of jabbing himself. I think this is really useful for babies when teething although as M gets a bit older I'd definitely switch him to an early toothbrush as I think he needs to get used to bristles and the shape of a normal brush.